The loud, jangly guitar drive, upfront splashy drums, and more guitar layering of “Shapes 1” opens Tilted Axes’ new LP Music For Mobile Guitars. 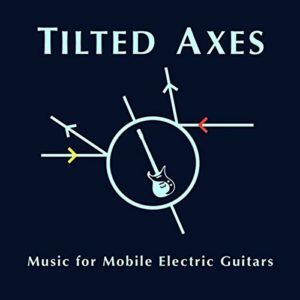 Since its inception, Tilted Axes has evolved as a project with multiple incarnations in New York, Detroit, and Düsseldorf, Germany, all from the composing/electric guitar playing talents and tutelage of composer/performer Patrick Grant. “Pedal Swells” is a layered cutting of effects arpeggiating into infinity. It has nice colors, but is not much of a tune. While “Rivera Court” fares much better, featuring a nice single guitar cutting through (did somebody say Steve Hackett?) and nicely picked signatures behind it that build to heavy strumming. “Asciae Obliquiae” moves at a rock and roll pace. I like the straight-ahead vibe of this one. “Beaubien Blues” is riff-tastic with a few guitars trading. One big, healthy wailing lead and the guitar harmonies of “Tunanna Claonta” reminds one of Martin Barre (guitarist with Jethro Tull and solo now, if you didn’t know) at his best. “The Sound of Burning Chairs” ends this collection with its low, simple base and flights of guitar roiling; it’s another heavy tune that works. Patrick Grant enlisted a bunch of players to help out here: electric guitarists Matt Grossman, Daniel Reyes Llinas, John Halo, Randolph Hudson III, Reinaldo Perez, Nick Didkovsky, Gene Pritsker, Howard Glazer, Anthony Mullin, and Larry Simon as well as Chapman Stick player Jeremy Nesse, electric bassists Dan Cooper and John Ferrari, and Cesare Papetti playing drums and percussion.